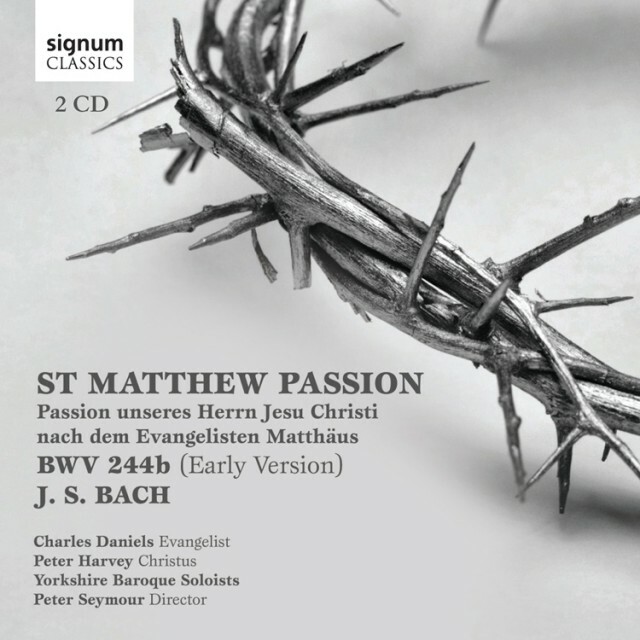 Yorkshire Baroque Soloists’ recording of JS Bach’s early version (1727) of St Matthew Passion (BWV 244b) is to be released on 12 January, 2015. Bach’s 1736 version is very familiar to audiences but his early version, performed here in a new edition by Peter Seymour, presents some startling alternatives and is the first recording of this revelatory version. For example, the aria, ‘Komm, süßes Kreuz’ which, in the later version, has a memorable gamba obbligato here has a lute as the partner instrument; the aria which opens Part Two, ‘Ach, nun ist mein Jesus hin’ is here scored for bass rather than alto. Yorkshire Baroque Soloists uses forces similar to those it seems Bach used for his early performances – single voices and instruments for the choir and orchestra. This allows an extraordinarily dramatic performance from the intimacy of ‘Komm, süßes Kreuz’ to the drama of the baying crowd in ‘Laß ihn kreuzigen’. The Evangelist is Charles Daniels and Christus is sung by Peter Harvey. The other soloists who, with Peter Harvey, also form the two choirs, are Bethany Seymour, Helen Neeves, Sally Bruce-Payne, Nancy Cole, Joseph Cornwell, Julian Podger, Matthew Brook and Johnny Herford (Pilate). The recording presents new and fresh insights into Bach’s great Passion setting and challenges afresh our thinking and understanding.